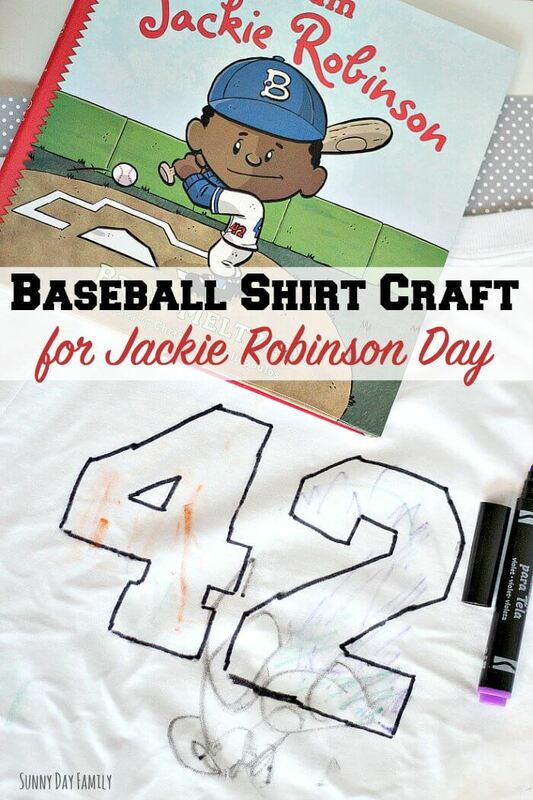 A fun way to celebrate Jackie Robinson Day with a baseball shirt craft for kids. We're a big baseball family, and we are all anxiously awaiting the start of the new season. As much as I love Opening Day, my favorite day of the baseball season actually comes on April 15. On this day, Major League Baseball celebrates the legacy of Jackie Robinson, who broke baseball's color barrier on April 15, 1947. So on every April 15 since 2004, every MLB player, coach, manager & umpire wears number 42 in honor of Jackie Robinson. I love being in the ballpark on Jackie Robinson day - to see everyone coming together and honoring Jackie Robinson's courage and commitment to both baseball and equality. I'm hoping to take the boys this year, and of course we need our own number 42 shirts to wear for the occasion! So I thought we'd turn it into a fun baseball craft to make ourselves. 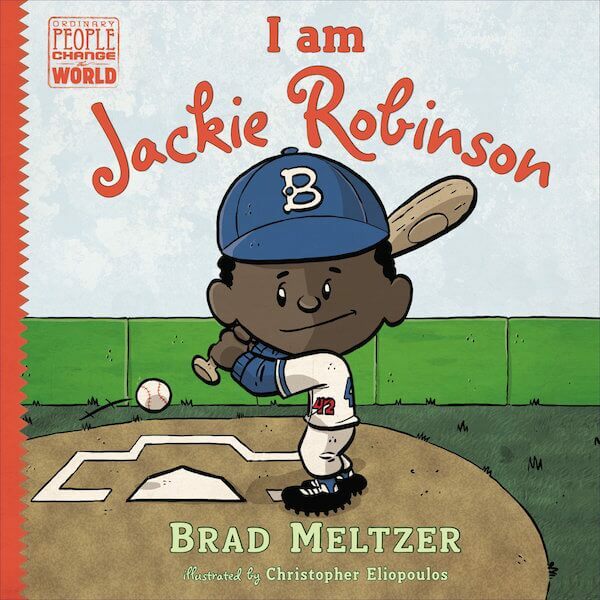 I wanted the boys to learn a little more about Jackie Robinson and Penguin Kids was kind enough to send me a copy of I am Jackie Robinson by Brad Meltzer (who is one of my favorite authors). I am Jackie Robinson is part of their Ordinary People Change the World biography series (don't miss a chance to win the whole series at the end of this post). I am Jackie Robinson is a great choice to teach kids not only Jackie Robinson's story, but also to inspire them. Jackie Robinson teaches us to be brave in spite of our fears, to treat others equally, and to be a leader no matter what anyone throws at you. 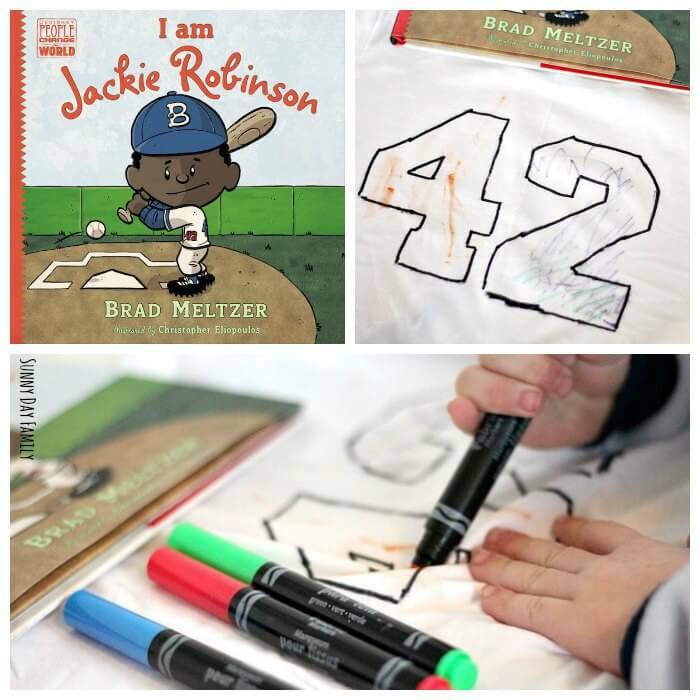 After reading I am Jackie Robinson together, we decided to make our own 42 shirts to wear on Jackie Robinson day. 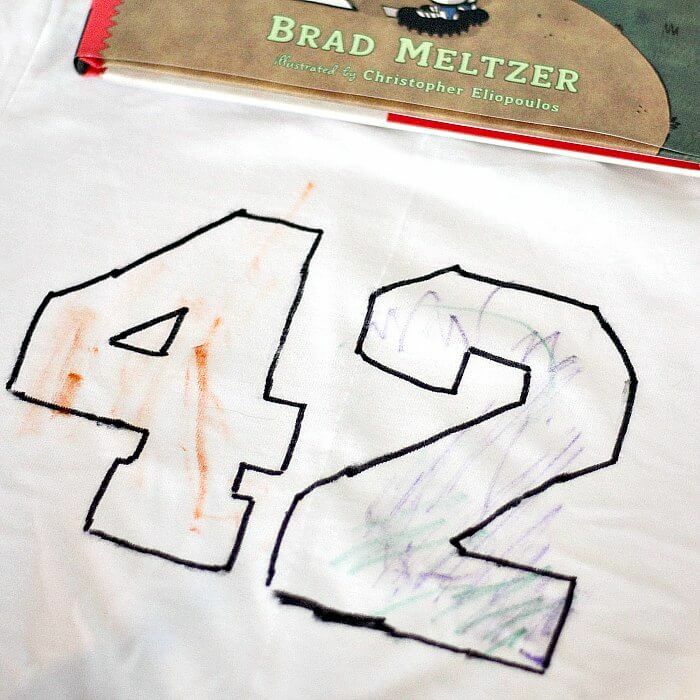 Making the shirts is a super easy and fun baseball craft for kids of all ages! Here's the how to. 42 stencil - download it here. 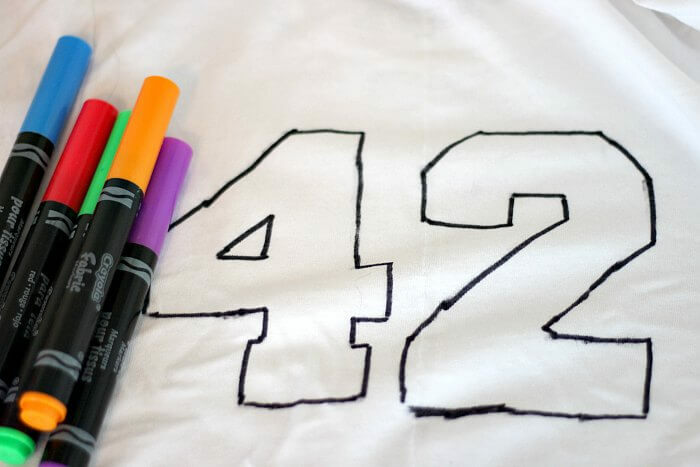 First, download your free "42" stencil here. Slide the stencil inside your t shirt with the number facing the back. Trace the 42 with a black sharpie. Go slowly and pull the shirt taut as you go for best results. 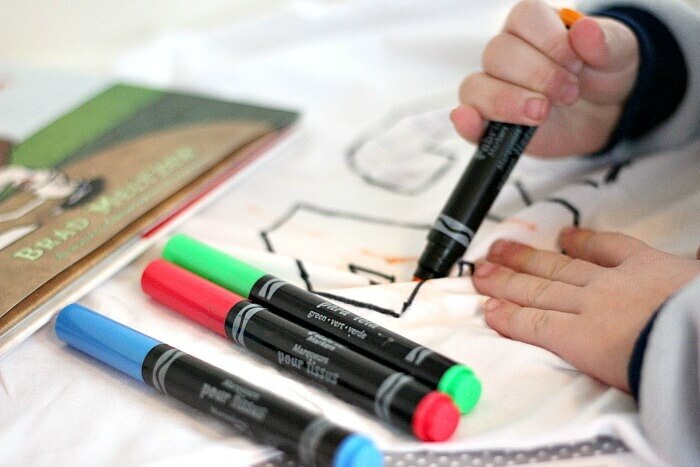 Once your outline is done, you're free to allow your kids to personalize their shirts with the fabric markers. Use your favorite team colors or create your own design - be creative and have fun! 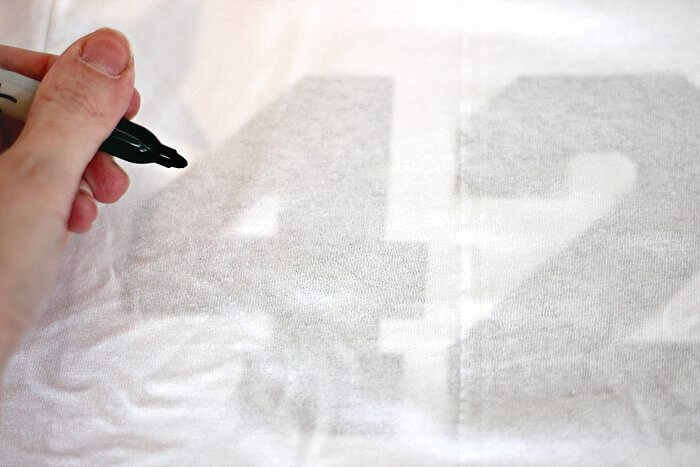 Once you're done, you've got your very own 42 shirt to wear on Jackie Robinson day! This is a super easy craft and lots of fun. Want more baseball fun? Check out all our baseball ideas including a handprint baseball gift and the ultimate baseball road trip!